Yin & Yang Beaded Silver Bracelet : LOVE2HAVE in the UK! A Yin and Yang beaded designer bracelet. The Yin & Yang is a powerful ancient symbol that conveys equal and opposite reactions to the universe. While we can't guarantee that the Yin & Yang force will have a direct effect on your life when wearing this particular bracelet, what we can ensure is an amazingly positive reaction from people who see it on your wrist. 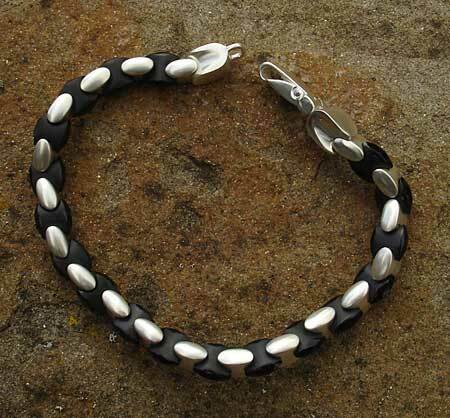 This piece is a two-tone bracelet featuring sterling silver and black onyx beads. They are linked alternately using an interlocking pillar design that is very secure. 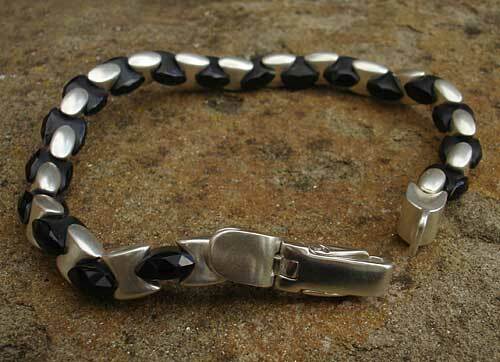 The onyx beads have a faceted cut to them and come in a polished finish, while the silver beads are smooth and rounded with a satin matt finish. They both measure approximately 8mm wide and the bracelet itself can come in any length, but we tend to find that 8.5 inches about right. Women may prefer smaller such as 7 inches or so. We can make it up to any length, so please contact us first. Finally, it comes secured to the wrist with a very sturdy sterling silver clasp, which again, is highly stylised for that ultra designer look. Metal(s)/Material(s) Available: 925 sterling silver and onyx. Returns Policy: You may return this item if it is not to your satisfaction as long is it is not engraved. Please see our terms and conditions.